Brazos-mints are found in sandy soils in only a handful of Texas counties. The first time I encountered a Brazos-mint was in May 1995 along U.S. Highway 79, between Palestine and Buffalo. At first glance, I thought they were dense stands of foxglove penstemon. However, when I turned my truck around and pulled over, I was enthralled to encounter an array of pink- to purple-flowered Centerville Brazos-mint with succulent, textured leaves and stems and a well-adapted deep taproot stem anchored into the dune-like sandy soils. Brazoria is a genus of plants in the mint family that contains three Texas endemic plant species, found nowhere else but the Lone Star State. Commonly known as Brazos-mints, these showy annual wildflowers feature blue, pink, lavender and purple blooms and range from 6 to 15 inches tall. Brazos-mints are narrow-range endemic plants found in Central, East and South Texas. Sand Brazos-mint (Brazoria arenaria) is found only in the Texas Sand Sheet (eight counties of coastal sand plain in deep South Texas) and blooms March through May. Sand Brazos-mint is associated with tallgrass grasslands dominated by seacoast bluestem and gulfdune paspalum. Enquist’s Brazos-mint (Brazoria enquistii) is endemic to the Llano Uplift (granite region) of Central Texas in Burnet, Llano and Mason counties and blooms May through June. Named in honor of author Marshall Enquist, the species occurs primarily on sand banks in and along beds of streams that drain granitic or gneissic landscapes, such as the Llano River and streams flowing into this river. Centerville Brazos-mint (Brazoria truncata) is restricted to open sandy areas in the Post Oak belt of East-Central Texas and blooms April through early June. These sandy openings are dominated by little bluestem, curly threeawn and purple sandgrass. Flowers are arranged in dense, spikelike clusters in four vertical rows. Fruit is a set of four separate small nutlets. Brazos-mint is a drought-tolerant plant that prefers not much plant competition. This plant typically co-occurs with numerous other dazzling wildflowers and is attractive to bees, butterflies and birds. Brazos-mint is visited by migrating monarchs in the spring, primarily in March and April. There are a few publically accessible places you can observe these showy, spring-blooming plants. For sand Brazos-mint, the roadside parks off U.S. Highway 77 south of Sarita are good locations; Inks Lake State Park is a great place for Enquist’s Brazos-mint; Gus Engeling Wildlife Management Area between Corsicana and Palestine has Centerville Brazos-mint. 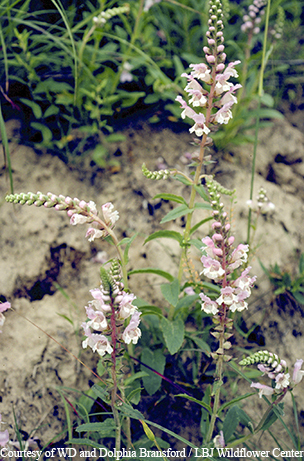 Centerville Brazos-mint is also known as “rattlesnake flower” because the flower heads resemble the rattles.